Welcome to www.nutsandboltscontracting.com. This website is owned and operated by Nuts and Bolts Contracting, LLC. By visiting our website and accessing the information, resources, services, products, and tools we provide, you understand and agree to accept and adhere to the following terms and conditions as stated in this policy (hereafter referred to as “User Agreement”). a. In order to access our Resources, you may be required to provide certain information about yourself (such as identification, contact details, etc.) as part of the registration process or as part of your ability to use the Resources. You agree that any information you provide will always be accurate, correct, and up to date. Impersonates any person or entity, including any www.nutsandboltscontracting.com employees or representatives. h. We do not assume any liability for any content posted by you or any other third-party users of our website. However, any content posted by you using any open communication tools on our website, provided that it doesn’t violate or infringe on any third-party copyrights or trademarks, becomes the property of Nuts and Bolts Contracting, LLC, and as such, gives us a perpetual, irrevocable, worldwide, royalty-free, exclusive license to reproduce, modify, adapt, translate, publish, publicly display, and/or distribute it as we see fit. This only refers and applies to content posted via open communication tools as described and does not refer to information that is provided as part of the registration process necessary in order to use our Resources. i. You agree to indemnify and hold harmless Nuts and Bolts Contracting, LLC; its parent company and affiliates; and their directors, officers, managers, employees, donors, agents, and licensors from and against all losses, expenses, damages and costs, including reasonable attorneys’ fees, resulting from any violation of this User Agreement or the failure to fulfill any obligations relating to your account incurred by you or any other person using your account. We reserve the right to take over the exclusive defense of any claim for which we are entitled to indemnification under this User Agreement. In such event, you shall provide us with such cooperation as is reasonably requested by us. Any defects in the operation or functionality of any Services and/or Resources we provide will be repaired or corrected. Any content downloaded or otherwise obtained through the use of our Services and/or Resources, whether paid or unpaid, is done at your own discretion and risk, and that you are solely responsible for any damage to your computer or other devices for any loss of data that may result from the download of such content. No information or advice, whether expressed, implied, oral, or written, obtained by you from Nuts and Bolts Contracting, LLC or through any of our Services and/or Resources, whether paid or unpaid, that we provide shall create any warranty, guarantee, or conditions of any kind, except for those expressly outlined in this User Agreement. In conjunction with the Limitation of Warranties as explained above, you expressly understand and agree that any claim against us shall be limited to the amount you paid, if any, for use of products and/or services. Nuts and Bolts Contracting, LLC will not be liable for any direct, indirect, incidental, consequential, or exemplary losses or damages which may be incurred by you as a result of using our Services and/or Resources or as a result of any changes, data loss, corruption, cancellation, loss of access, or downtime to the full extent that applicable limitation of liability laws apply. All content and materials available on www.nutsandboltscontracting.com, including but not limited to text, graphics, website name, code, images, and logos are the intellectual property of Nuts and Bolts Contracting, LLC, and are protected by applicable copyright and trademark law. Any inappropriate use, including but not limited to the reproduction, distribution, display, or transmission of any content on this site is strictly prohibited, unless specifically authorized by Nuts and Bolts Contracting, LLC. This website is controlled by Nuts and Bolts Contracting, LLC. It can be accessed by most countries around the world. By accessing our website, you agree that the statutes and laws of our state, without regard to the conflict of laws and the United Nations Convention on the International Sales of Goods, will apply to all matters relating to the use of this website and the purchase of any products or services through this site. UNLESS OTHERWISE EXPRESSED, Nuts and Bolts Contracting, LLC EXPRESSLY DISCLAIMS ALL WARRANTIES AND CONDITIONS OF ANY KIND, WHETHER EXPRESS OR IMPLIED, INCLUDING, BUT NOT LIMITED TO, THE IMPLIED WARRANTIES AND CONDITIONS OF MERCHANTABILITY, FITNESS FOR A PARTICULAR PURPOSE, AND NON-INFRINGEMENT. When ordering or registering on our site, as appropriate, you may be asked to enter your name, e-mail address, mailing address, phone number, credit card information, or other details to help you with your experience. We implement a variety of security measures when a user places an order and/or enters, submits, or accesses their information to maintain the safety of their personal information. We will notify you via e-mail within 7 business days. Market to our mailing list or continue to send e-mails to our clients after the original transaction has occurred. 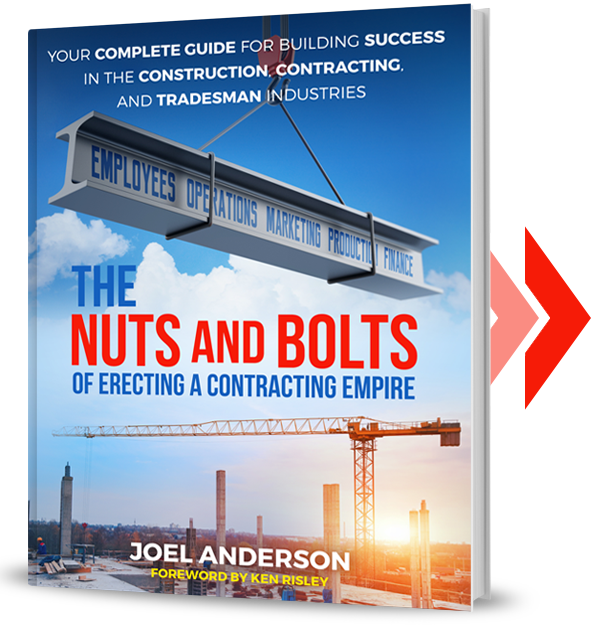 If at any time you would like to unsubscribe from receiving future e-mails, you can e-mail us at joel@nutsandboltscontracting.com or follow the instructions at the bottom of each e-mail and we will promptly remove you from ALL correspondence. The products, services, and resources offered through the nutsandboltscontracting.com website and by Nuts and Bolts Contracting, LLC or Nuts and Bolts Academy are for educational purposes only and specific financial outcomes are not guaranteed. Nuts and Bolts Contracting, LLC and any of its officers, employees, or associates are not making any claims as to the amount of income you may earn or the increase in business achievable. Each company is unique and several factors influence the outcome of any business-building program including market conditions, size of company, business experience, ability to implement key practices, and existing resources, as well as any other conditions, problems, or barriers not mentioned. While Nuts and Bolts Contracting, LLC and any of its officers, employees, or associates make every effort to assist companies and individuals in achieving greater success, the outcomes are expressly determined by the efforts and direction taken by the recipients of this educational system.